For our February meeting were joined by Shula Levy of Out of Space. Shula is a personal organiser and de-clutterer who offered us tips and inspiration for a new year’s clearout of all that stuff which is definitely taking up space in our cupboards, drawers, lofts, basements, offices, garages and garden sheds. We thought February was the right time for this guest speaker and I think everyone came away ready to embark on some 2018 spring cleaning! Our January meeting was our annual pub meeting, once again this year at The Mossy Well at the top of Muswell Hill, to welcome in the new year and to debate and vote on the shortlist of WI resolutions for 2018. Thank you to those intrepid souls who made it out on a wet winter’s evening, only a day after New Year’s Day, to socialise informally over a glass of wine and learn about and vote on resolutions for 2018, and to learn a little about WI campaigns. We voted on our preferred resolution and the results have now been submitted to the Middlesex Federation. Once again we enjoyed the buzzy environment of the pub, however we did realise that it really doesn’t work for a ‘business’ meeting, and next year we’ll be back at CUFOS or much quieter place, possibly a private room in a pub! We will also be considering some pub get-togethers in between meetings for those who’d like to catch up… watch this space. We’re at A Very Merry Muswell 2017! 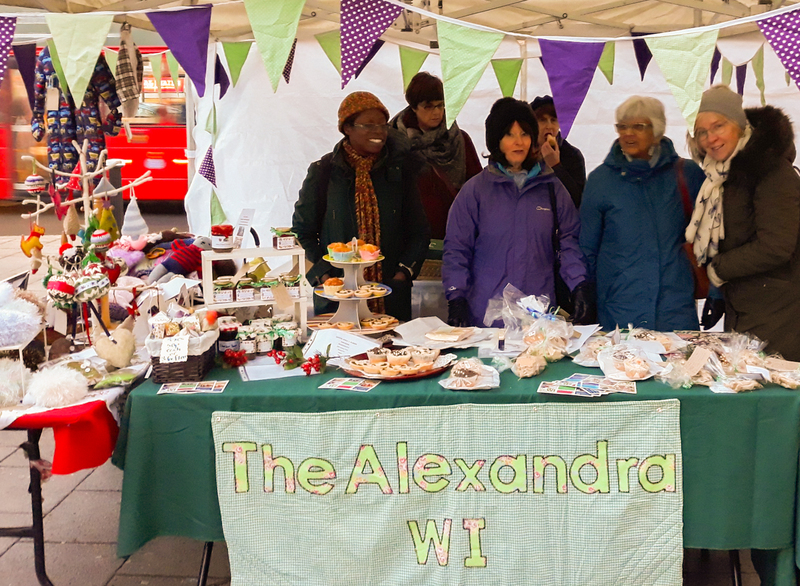 Once again The Alexandra Women’s Institute will have a stall at A Very Merry Muswell in St James’ Square, Muswell Hill on Saturday 9 December 2017. We had a ball at last year’s event – at least when we were not trying to prevent our fingers and toes from freezing! 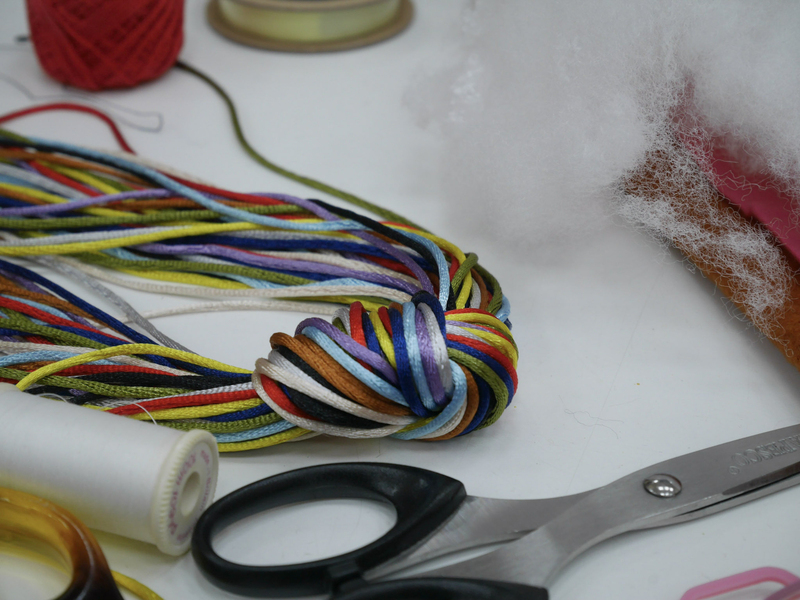 We’ve already been busy creating craft goodies to sell on the day – and yes: good news! 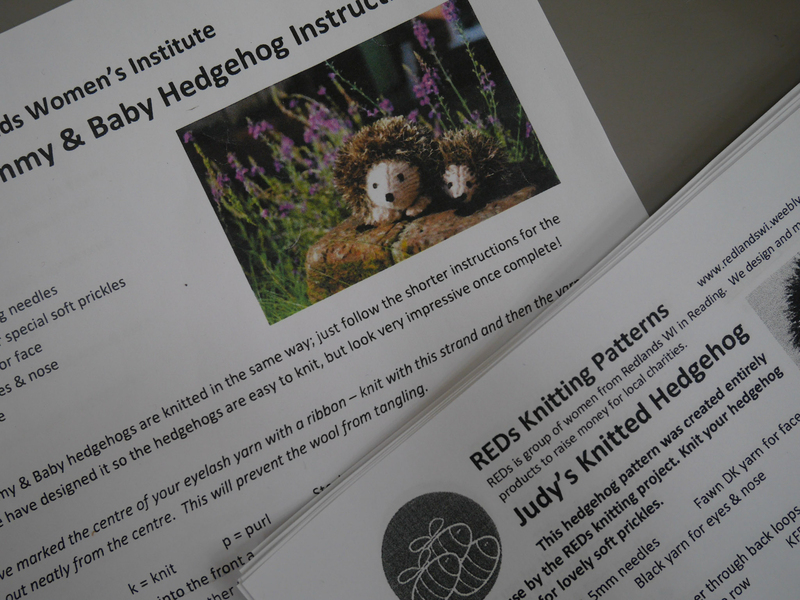 Our signature disco hedgehogs will be available once again, though you will need to get in early as they will definitely sell out. We also have some handmade Christmas decorations and of course, cakes, biscuits, jams and preserves and other home-made treats to enjoy! You can read more about the event here… We look forward to seeing you there! For our penultimate meeting for 2016 we were thrilled to have not one, but three speakers who are all involved in fabulous projects in Haringey which have a ‘green’ tinge – whether in name, philosphy or both! First up was Laila Hackforth-Jones from the Muswell Hill Sustainability Group, a busy grass-roots group working to reduce carbon emissions and waste in the local area. Laila spoke of some of the Group’s initiatives, which have included educating local residents on the safe use of solid-fuel burning stoves and tours of local energy-efficient houses. We then heard from Sylvia Dietz of Wood Green’s Green Rooms art hotel, a social initiative supporting artists and creatives, housed in the beautiful 1930 headquarters of the North Met Electricity Company. We we were all inspired by the sensitive renovation of this handsome building. Sylvia Dietz of Green Rooms art hotel in Wood Green. Finally, Alice Hardy of Jan Kattein architects, designers of the Blue House Yard project, spoke about this temporary space in Wood Green, a cluster of double-storey timber workspaces around an open courtyard used for markets and events. Alice Hardy of Jan Kattein Architects, on Blue House Yard. Alice Hardy of Jan Kattein Architects and Sylvia Dietz of Green Rooms art hotel with The Alexandra WI secretary Nina Jewell. Sylvia Dietz of Greens Rooms chats with The Alexandra WI members Sally and Nina. October at The Alexandra WI means a Christmas crafting session in preparation for our Stall at A Very Merry Muswell in December. 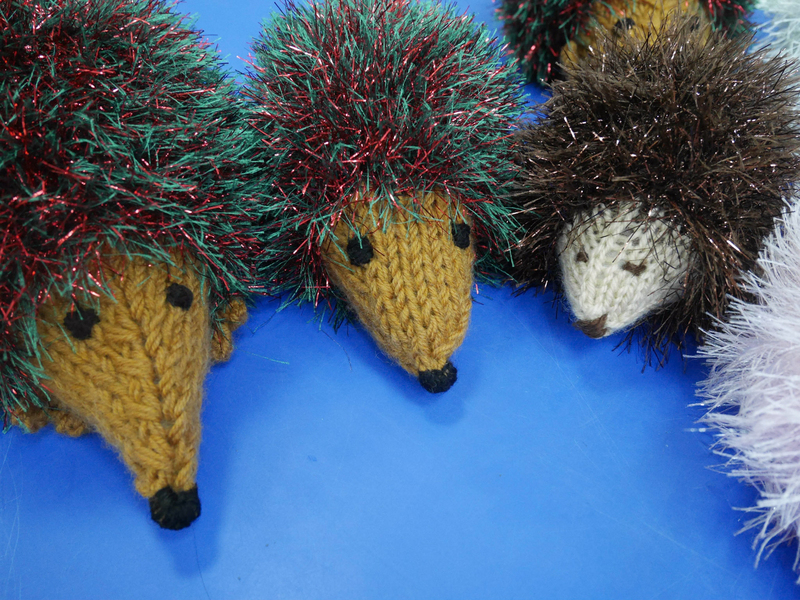 This year on the agenda we had decorative fabric baubles, felt Christmas trees and our signature disco hedgehogs, which were, despite their short legs, a runaway success at our Midsummer Muswell stall in June. For our September meeting, we handed the floor over to our members to hear their stories. We heard from Gill Whitney, Diane Morrison, and Carol Norton on their diverse work lives and other stories! Gill talked about her work with on standards, particularly in the field of technology and equality in user experience of the internet, while Diane spoke of the varied and challenging work she does as a legal advisor at the Hackney Community Law Centre, and Carol shared her experience of work as an architect. Thank you to Gill, Diane and Carol for sharing their stories with us! July 2017 saw The Alexandra WI women de-camp to the courtyard of CUFOS to enjoy a relaxed evening of wine tasting on a balmy North London summer’s evening. Led by Rob, the amiable manager of Muswell Hill Majestic Wines, we were led through a tasting of a series of white and red varieties from a light Chablis through to a full-bodied Malbec. All in all a fun and educational evening! A little post about the marvel that is Denman College. 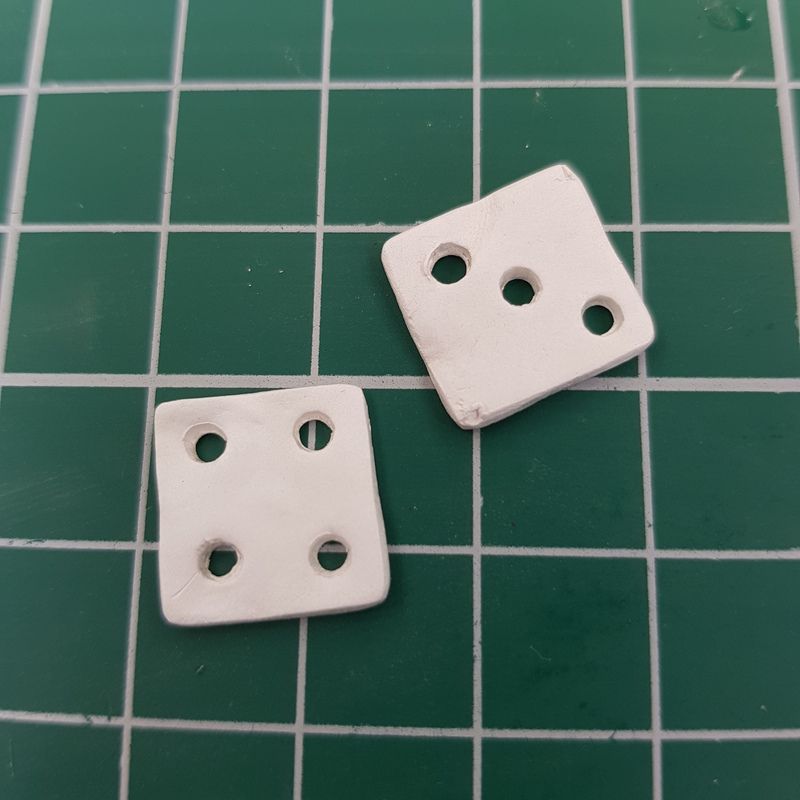 I was the fortunate winner of The Alexandra WI’s second annual Denman bursary in May, and promptly booked into a Silver Clay Jewellery course. What an absolute ball we had over the three-and-a-bit days with eight fab ladies (5 Denman pros and 3 newbies) creating pendants, charms, silver leaves, brooches and earrings. It’s a wonderful, convivial atmosphere with seemingly constant food and drink, and the beautiful house and garden to enjoy. Here are some images from the weekend – including a selection of the final, fabulous pieces. Never been to Denman? Time to take a look at what is on offer here! On a sunny Saturday in June, seven members of The Alexandra WI headed down to the north Kent coast to visit our twin WI, Reculver Beacon, in Herne Bay. 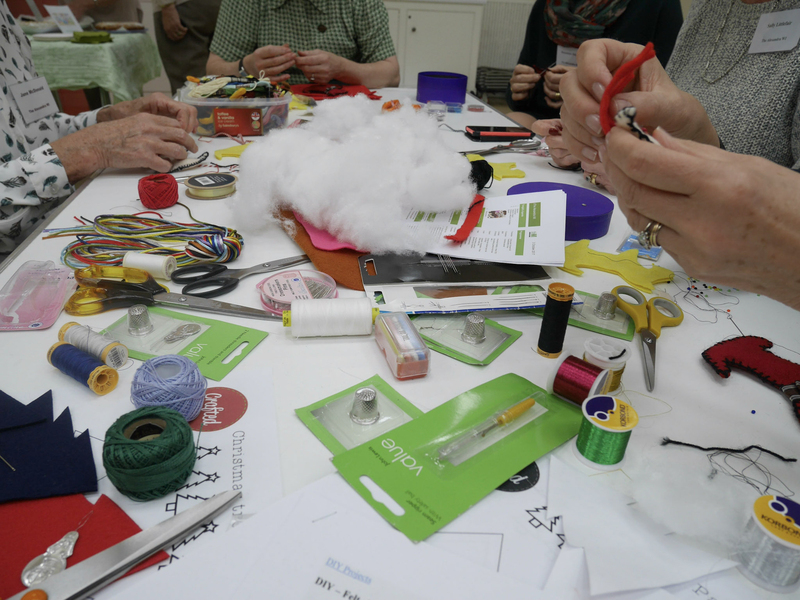 The Reculver Beacon ladies had not only prepared a lovely lunch spread with scones, cream and fresh strawberries, but had also organised a craft session involving creating decorative tins using an array of papers, fabrics, buttons, beads and other decorations. I think we came up with some lovely creations! Thank you to Claire, Mandy and Karen and the members of Reculver Beacon for welcoming us so warmly and making such an effort! For our July 2016 meeting, we held a ‘getting to know each other’ session. During that meeting we discovered that our member Chris Randall was a budding flower arranger. We invited Chris to teach us about flower arranging at our June 2017 meeting, and what fun we had! I think we all surprised ourselves with the final results: see for yourself here! Thank you so much Chris for your time and effort – we are all inspired and keen to take up your challenge of creating over-the-top Christmas centrepieces in a few months! Our Annual Meeting was held on 2 May 2016, with our Middlesex Federation WI Advisor Yvette Rathbone. We balanced the business end of the meeting with a fun quiz followed by tea and our inaugural scone competition. Maggie Weatherby read the Annual Report prepared by outgoing Secretary Jayne Fowler, recounting our busy year. Yvette ably officiated for our elections at which Emma Watson was elected a President for a third term, and the current committee, minus Jayne, was re-elected. Nina Jewell – Secretary. Once again the Secretary will be assisted by Rosemary Pettman as minute secretary. Rosemary will also continue her co-ordination of all things food and drink. We also held our inaugural Scone competition: sadly only a few entries, but all judged with appropriate seriousness by Yvette, who declared Rosemary’s the winning scones. Well done, Rosemary! 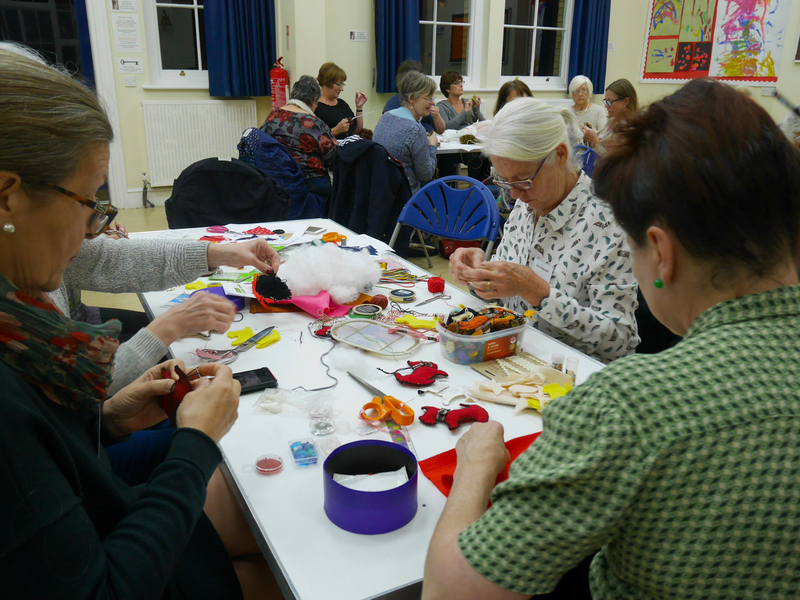 Middlesex Federation of Women’s Institutes set its member WIs the challenge of creating a pennant to form part of a collective MFWI string of bunting made up on one pennant for each WI. The Alexandra set to! There was no doubt we would not incorporate an image of our iconic namesake, Alexandra Palace. President Emma Watson interpreted the south elevation as a simple ‘stitchable’ diagram. 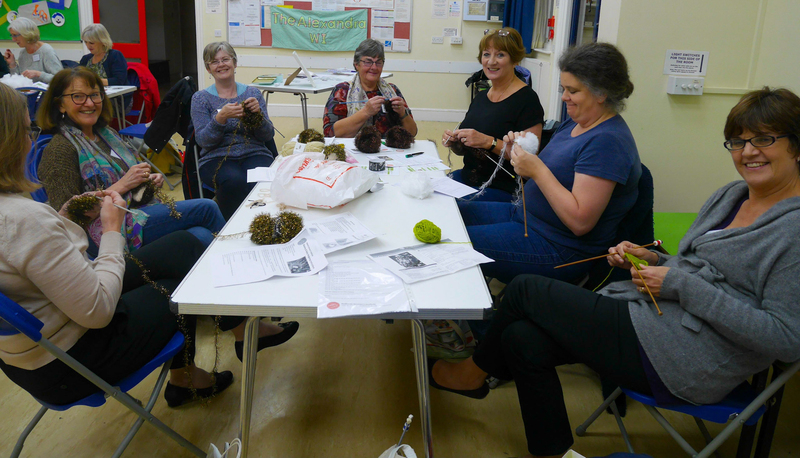 Committee member Ching Smith then began the task of stitching the palace and our name, while members created cute ‘micro-knitting’ and woollen flowers to add a flvour of what the WI is all about. 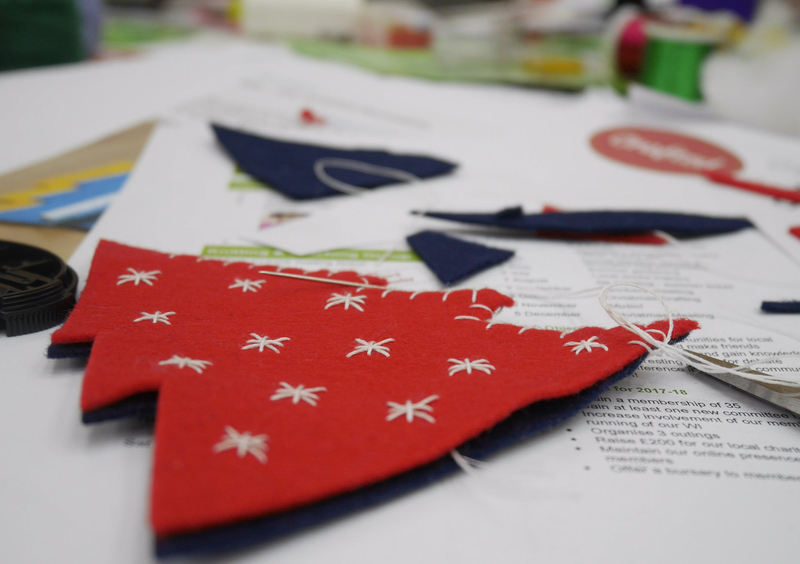 We are now looking foward to seeing the completed bunting: stay tuned for an update! What a fantastic meeting we had in April 2017! We were joined by Jenni Parker, the Volunteer and Programmes Manager for Fine Cell Work, a charity which trains prisoners in across the UK in needlework. Fine Cell Work was founded in 1997, but it had its genesis in the 1960s when, as a visitor to HMP Holloway women’s prison in the 1960s, Lady Anne Tree worked with two long-term prisoners on intricate needlepoint projects. Convinced of the therapeutic value of sewing, Lady Anne felt that the women who had put so much hard work into the pieces should be able to earn money from their work, and she became determined to establish an organisation in which prisoners could learn a skill to the highest level and be paid for their efforts. After decades of lobbying the Home Office to change the law so that prisoners could earn money from their work she achieved her goal. Today, Fine Cell Work has 60 volunteers training over 400 prisoners in 29 prisons across England, Scotland and Wales and prison systems in other countries have expressed interest in starting similar schemes. Jenni shared some personal and moving stories of the prisoners involved in the programme, reminding us of the genuinely transformative power of the mindful act of needlework. The examples of the work she brought along were beautiful – a few lucky members made some special purchases. You can read more about Fine Cell Work here. The WI Fair has come and gone… It was held at Alexandra Palace Wednesday 29 March – Saturday 1 April. Several of our members attended, and a few were lucky enough to be photographed with WI luminaries incluing National President Janice Langley. Here are a couple of pictures of these fab women. At our March 2017 meeting, we were joined by Michael Hanley, immigration Solictor at Wilsons LLP, and advisor at the New North London Synagogue Asylum Seekers Drop-In Centre. Michael refreshed us on the twentieth century history of refugee law, as well as sharing with us some of the challenges faced by those seeking asylum in the UK in 2016. A special thank you to our long-time member June Lewis, pictured with Michael Hanley, for putting us in touch with the Drop-In Centre. We got creative for our February meeting, with a guest speaker from the local Potter’s Yard studio in Tufnell Park. Liz Mathews is first and foremost a ceramic artist, but she combines her work in clay with her love for lettering and words. Liz took us on a slideshow journey from her early explorations of clay to her more recent large format works on paper, describing in detail her momumental work Thames to Dunkirk, with texts by BG Bonallack & Virginia Woolf. We were all fascinated by Liz’s inovative folding books too! In January 2017 we continued our tradition of a casual pub meeting as a chance to socialise informally over a glass of wine and reflect on the year just gone. As in previous years, we took the opportunity to review the National Federation’s shortlisted resolutions for 2017 and voted on the one we’d like to see go forward to the Annual Meeting in June. We also had a chance to talk about what we enjoyed in the WI and share ideas for the future of our six-year-old group.